Today’s UK is a great place for entrepreneurs. 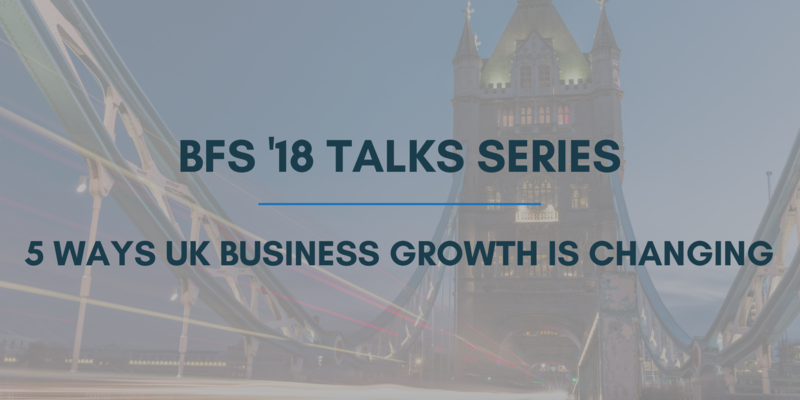 So agreed the six business finance leaders brought together for a panel on business growth at our flagship Business Funding Show 2018: UK Business Angels Association CEO Jenny Tooth, British Business Bank CEO Keith Morgan, BVCA Director General Tim Hames, Head of LSE’s ELITE Growth UK & Licensing Umerah Akram, Crowdcube Chief Commercial Officer Matt Cooper, and Spotcap Managing Director for Benelux and the UK Niels Turfboer. In today’s UK, it seems, the small business is king. To make the most of this golden age of SMEs, however, entrepreneurs must keep pace with an ever-evolving business funding scene. Read on for insights from some of the industry’s most forward-thinking leaders. Many were born outside the UK and are more international in background and perspective. As a result, Tooth points out, business angels and VCs are now more similar in background and therefore connect more easily. This also goes for entrepreneurs, who will likely find VCs more relatable today than ever before. In the past few years, UK VC investment alone has increased from about £325 million to over £3 billion. The growth of venture capital reflects the continuing spectacular growth of alternative funding in general. And, according to Keith Morgan, more and more entrepreneurs are taking advantage of this growth. While bank growth remains stagnant, he says, entrepreneurs are shopping around and testing their options, which is great for both the entrepreneurs and the economy. For an even more exciting picture of the potential of alternative funding, add into the mix the increasing acceptance of alternative finance by the most traditional of funders: banks. Cooper expressed enthusiasm about his platform’s collaboration with UK banks to provide entrepreneurs with even more options for financing their businesses. Unfortunately, the influence of alternative funding has been largely limited to London, where most of the nation’s funding organisations are based. The panel cite some eye-opening statistics on the state of alternative funding in the rest of the UK. Although there are just as many businesses in the North as in London, says Morgan, the capital received 50% of the nation’s equity investment. This may be partly because, as Tooth notes, today’s tight connections between angels and VCs, who are increasingly cooperating and co-investing, are mostly a London phenomenon. In the regions, where fewer investors are located farther away from one another, these relationships remain dispersed. While the reasons for this disparity are complex, Morgan emphasises the need for better education on funding options in the regions. He explains that many of these companies are cautious; they were forced to reset financially to survive a global financial crisis and are reluctant to do it again. Indeed, 70% of small businesses in the regions would rather forgo growth altogether than take on risky liabilities. Morgan hopes to help change this through ‘better information’ on the funding options available and why taking on finance, especially equity finance, might be worth the risk. While there remains a sizable gender gap among entrepreneurs and investors alike, change is happening. Tooth, a strong advocate for women in business, points to an increase in women entrepreneurs, though only a small number of them are accessing angel investment. Even if women are still fewer, they are engaged and successful. Cooper reports that female founders have a much high success rate in crowdfunding and that about 35% of investors on Crowdcube. Noting the shaky confidence of small businesses in the wake of the Brexit vote, Morgan says, the British Business Bank braced itself for disappointing statistics for 2017. To everyone’s surprise, however, there were no signs that Brexit had slowed down the business world. 2017 was a strong year for alternative funding, particular asset finance. UK peer-to-peer lending grew by 50%, the value of equity investments in small businesses by 70%. With only 7% of small businesses planning to scale back due to Brexit, it’s clear that entrepreneurs are noting this stable financial climate. Because of some excellent exits from VCs. Because UK angels and VCs are more interconnected. Because initiatives from the likes of the ELITE programme have increased the level of knowledge about funding among entrepreneurs. Because of organisations such as the British Business Bank and policies such as EIS/SEIS. All of these phenomena should continue with or without the EU. If anything, the EU has been a constraint on growth. With that said, Morgan and Tooth both warned against complacency. Many important sources of funding and support come from the EU. The national and local governments will need to create measures to replace these sources. The panel also emphasised that, for UK small business anxious about Brexit, ‘the uncertainty is the killer.’ By the end of this calendar year, he predicts, the government will have a firmer plan, reducing the uncertainty and anxiety on all sides. The past year since the last Business Funding Show was been filled with unprecedented growth, peppered with anxieties and disparities. In light of these trends, the panel offers a few words of advice for entrepreneurs. Akram encourages entrepreneurs to ‘ensure that their value proposition is articulated in a way that resonates with the investor they are speaking to.’ They need to do due diligence on investors and think strategically, rather than leaving fundraising to the last minute and choosing the first investors who show interest in them. Cooper wants entrepreneurs to consider a funding mix, as opposed to one source of capital. Panelists agree that companies with a presence in Europe and facing Brexit-related uncertainty should remember that they will have access to UK resources (e.g., EIS/SEIS) as long as they have a UK base. UK investors want internationally-minded businesses. All wanted entrepreneurs to know that there’s never been a better time to be a business owner in the UK. Despite the uncertainties of Brexit and the work to be done bringing the rest of the country up to speed with London, the business finance climate is only getting better. Stay tuned for more coverage of our full day of panels and talks to get expert advice on going global, raising for a tech business, business law for startups, and more. Looking to create your perfect pitch? Attend our next event ‘Pitch Perfect! Secrets Revealed’ on April 4. Tickets can be found here.